RARE Aircraft » Blog » General » Why a Stearman? Last year there was a thread on the Stearman Restorers Association forum that begged the question, “why a Stearman”? I typically do not get all that involved in forums but I was on vacation and the question got me thinking. Thought I would repost the story here on the blog. Hope you enjoy. Our Stearman lived at a neighboring airport about 28nm away. Our friend Tony owned it and very much enjoyed doing so. He purchased the aircraft in the early nineties, flew it often and shared it with many. A side bar about Tony; There was a point in my flight training that I needed complex time in my quest to build hours. Insurance companies wouldn’t touch me in a Bonanza. Tony felt compelled to check me out in his S model Bonanza on a Saturday afternoon, tossed me the keys and said, “bring it back in two weeks washed with an oil change. If you break it, you buy it”. He also knew this afforded me the opportunity to do a long cross country with my CFII who was coincidentally my fiancé, to go and meet her family. So, off we went, uninsured, happy and logged the hours required to get accomplished what I wanted to get done. That’s the kind of guy Tony was. About a year later Tony lost his medical sometime early 2004. He quit flying his Bonanza and we helped him sell it. His Stearman remained. He continued to fly it for a couple of years. Sometime around ’04 he began to call me every year asking if I would put an annual on the Stearman for him so he could sell it. We always turned that conversation into a social visit and the annual never happened. Deep down, he didn’t want to sell it. Of course the time on the hour meter didn’t hold still. No yearly call from Tony. I opted to give him a call to tell him I would like to come take a look at the Stearman and see what he would need to do to get it going. My way of checking in with him as he with did me. This also presented an opportunity to gauge what I suspected of our friends health. He asked to meet in person. I brought a check with just in case. The airplane was in serious need of attention but not a loss. The last sign off in the logs was nine years old. Tony and I looked it over and discussed what needed to be done. We both knew the best short-term thing for the airplane was to get it running and out of the dilapidated hangar in which it resided. Even though we agreed on this need it was clearly not easy for him. He even became upset recounting prior visitors picking on the airplane playing the pre-buy game with hired “experts”. Nobody likes his or her loved one picked on. Our discussion, coupled with the required maintenance it needed, led to an option to purchase the airplane. We made the deal, he gave me a key to the hangar and left. Tony did not want to be around to watch his airplane leave. I later came back and spent the afternoon with my friend Mark getting it ready to fly. I also called in a ferry permit planning on returning the following day to fly it home. The next morning my friend Chuck drove me over, eyed the airplane and gave me the final motivation I needed by saying, “if you don’t fly it, I will”. Once home I promptly sent a photo of the airplane to my good friend Pete Jones. He responded immediately asking where I got that airplane. Turns out, that very airplane was from his hometown. He’s known it a good amount of his life and, purchased it when he was fresh out of A&P school. It was one of his first. I came to learn the paint scheme on the airplane was of Pete’s choosing to match the dusters of his hometown he watched as a kid. Also, this particular airplane was one of that hometown fleet as a “two holer” for training. We put a lot of maintenance into Tony’s Stearman, washed it up and listed it for sale. While we had it listed, I flew it. I flew it a lot, growing pretty fond of the airplane. In the back of my mind this airplane was merely another flying opportunity afforded to me by being in the biz. While for sale a buyer engaged us and asked for more information. I scanned all the records and with them, emailed about forty photos. He called and asked for more photos so, I sent dozens more. He called and asked for more! At that point, suspecting so, I asked if he flew for the airline, he said yes, so I said “hop on a damn pass and come see the airplane if you’re serious!” An argument ensued and I ended the conversation with shutting down the sale. Apparently I was vociferous enough (those who know me can attest) to garner Dad’s attention from his office. He came to see what the commotion was about. He asked and I started to unload on him. He interrupted me with a smile and said, “Well, if it’s so hard to sell then why don’t you keep it.” I paused and without a second thought said, that’s a good idea. Two years later we made a deal with Air Repair to purchase their Stearman inventory. Thus far the A.R. acquisition has been a nice fit into our business. That idea and move had nothing to do with our purchase of Tony’s Stearman. Tony’s Stearman probably had more to do with the purchase of Pete’s inventory. Prior to our current Stearman ownership and the Air Repair deal, RARE Aircraft had restored four Stearman’s and resold three others we had taken in trade but none ever stayed around. So I now ask myself the question this forum thread begs. Why a Stearman? Here’s why. I love our Stearman. It’s straightforward to fly. Every detail is well documented and it doesn’t require the use of voodoo and Sanskrit to maintain or find parts for. There is an awesome community and support network that has done nothing but make my family feel welcome. I can see a good Saturday forecast midweek, pick up the phone and easily have a gaggle of Stearman’s assembled to go flying with. It’s the perfect airplane to put someone in the back seat and share the biplane experience with. It’s the best airplane we’ve ever owned that’s perfect for going nowhere in particular and performs aerobatics well. It brings people together. It keeps people in touch. We lost Tony summer of 2015. I was able to bring the Stearman over to his home airport last father’s day for a fly-in before he passed. Tony and I spent some time talking by his “favorite airplane ever.” He had on his matching shirt with N#. He wasn’t physically able to go for a ride however, he thoroughly enjoyed seeing his airplane again and spending time at the airport. On the way home from the fly-in I figured that was probably the last time I’d see him. I was right. One of the most prominently displayed photos at Tony’s funeral service was of him in his Stearman. He really loved that airplane. Pete Jones has been a good friend, mentor and business partner. Tony was a darn good friend. 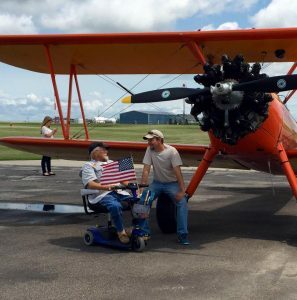 The Stearman community has been more than kind and, forgiving of a mouthy kids biplane prejudice of the past. Our airplanes, they bring people together and keep us in touch. The fringe benefit is they’re really fun to fly and share. To the aficionado of collectable and rare aircraft the Stearman may be a more common antique however; it’s also common to find a multitude of great people associated with them. A disclaimer for my biplane friends of all makes and models. I sure love our WACO too. I’ve been all over the USA in a UPF-7 and always say an F-7 fit’s like my favorite pair of blue jeans. Each different kind of biplane holds a different spot in my heart. Looking back, I don’t know why I denied myself the privilege of more experience, fun and friends of all walks of biplane loyalty. So the next time you have an opportunity to fly something different or share your airplane, don’t pass the opportunity up. It will likely open your eyes to a new learning experience, a deeper appreciation for what you have and a new friend you never knew you had. There are likely many of you who have read this, smiled and thought “he just didn’t know any better” and life’s experience has lead you far beyond this personal passage I’ve shared. So with that said I’ll leave you with much gratitude for your patience, understanding and in some cases forgiveness.